The term 'communism' may have raised the hackles on the back of those resided under the unnamed terror of Cold War, but it is not the idea which was evil, merely those who wielded it as their reason to rise to power and to control the masses. 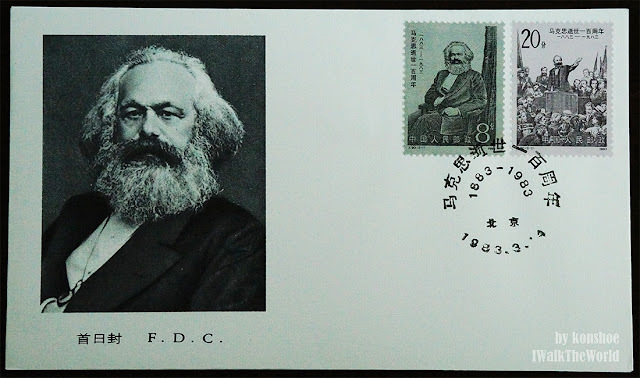 It is therefore unfortunate that he is remembered by most as the person who set forth the ideals which led to the rise of the Red Army and the split of the Western civilization of the 20th century into two. 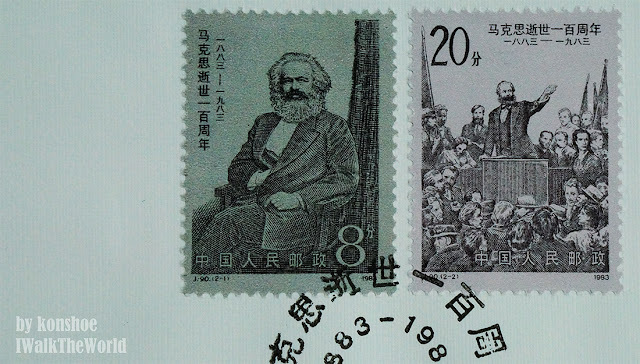 Being a communist country back in the 80's (and still is now), it is of no wonder that China chose to commemorate the great thinker on the centenary of his death (he was found dead from bronchitis and pleurisy - Wikipedia). After all, it was his ideas which led indirectly to Maoism, an ideal which was ingrained into the life of the Chinese in the later half of the 20th century. The FDC commemorating centenary of Karl Marx's death.